Cats hide their pain as a survival mechanism. If predators know a cat is in pain, it will be seen as weak and vulnerable. While this is important in the wild, it can make it difficult for us as cat owners to know when they are experiencing pain. At Anasazi Animal Clinic in Gilbert, we want to make sure you know how to tell if your cat is in pain, so we can help him or her. Hiding— Many cats are aloof and hide normally. But if you notice a change in how much your cat is hiding, this may mean that he or she is in pain. Pain will often make a cat withdraw from its normal activities. Decreased Appetite— Just like humans, cats are often not very hungry when they are in pain. Unlike humans, they don’t put themselves on diets. So if your cat is not eating as much as normal, it’s worth bringing him or her in for a checkup. 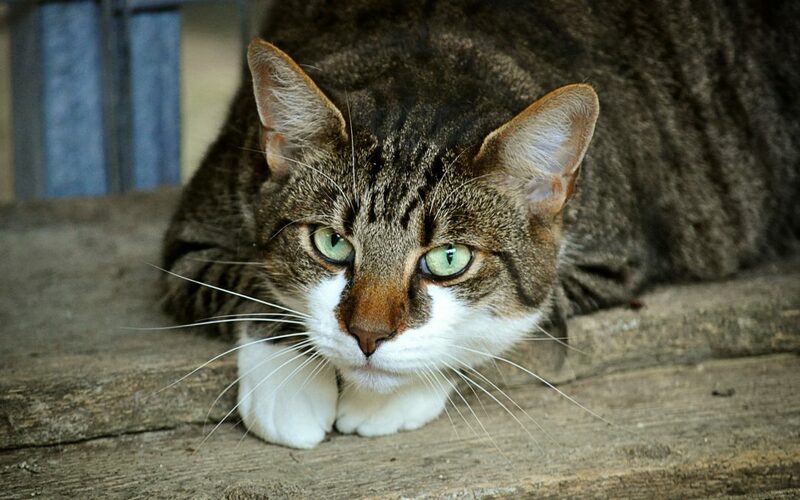 Cats can develop fatty liver disease when they do not eat enough for several days. Changes in Litter Box Usage— Increased urination, along with increased thirst, could indicate kidney disease. Frequent attempts to urinate, or meowing and straining while using the litter box could mean a urinary tract infection. This can be quite painful and needs to be treated right away. Difficulty Jumping— Lots of cats love to perch in high places, like the refrigerator or shelves. If your cat seems to be staying closer to the ground suddenly, this may be a sign that he or she knows jumping will be painful. Hunching Up — A cat that is walking or lying on its side with its back arched and abdomen tucked up, may be experiencing abdominal or spinal pain. Grooming Changes — Cats that suddenly aren’t grooming themselves might be in pain. You might notice matted or dirty fur. Or if your cat is incessantly grooming one area, this also might be an indication that he or she is in pain. Changes in Behavior — If you notice anything different at all about the way your cat is acting, this might mean he or she is having pain. Sudden irritability in a usually sweet cat can be a sign of pain. They also might be less active. Refusal to lie down or sleep is another signal of possible pain. Osteoarthritis is a common cause of behavioral changes associated with pain, especially in aging cats. If you have any more questions on how to tell if your cat is in pain, please give us a call. Or if you suspect that your cat is experiencing acute pain, be sure to bring him or her in right away to Anasazi Animal Clinic. We offer urgent and emergency care services six days a week in two convenient Gilbert locations. Your cat’s health and happiness is just as important to us as it is to you!